Fairey at work in Detroit. 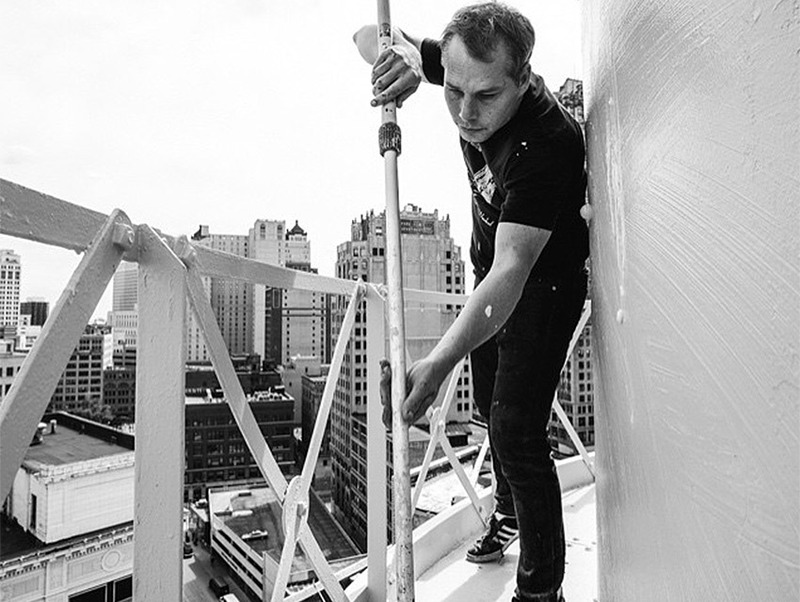 He shared this image of himself on Instagram, working on what appears to be a city water tower. The finished product appears below. Fairey is a wanted man in Motor City, where he was charged in June with two felony counts of malicious destruction of property. The artist was in the city at the behest of Dan Gilbert, owner of the Cleveland Cavaliers, to create a commissioned 18-story mural on one of Gilbert’s other businesses. Per the city’s police, Fairey caused over $9,000 in damage this past May by pasting unsanctioned posters (of his trademark Andre the Giant variety) onto various edifices across the city. He was apprehended July 6 at LAX upon returning to L.A. from Europe; when he passed through customs, authorities noticed an outstanding arrest warrant issued by the Detroit Law Department. This isn’t the first time Fairey has gotten tangled up with the law; in 2012, he was involved in a copyright battle with the AP over those same Obama posters. Fairey denied that he based his rendering of Obama off of an Associated Press photograph. Spoiler alert: he lied. He was sentenced in federal court to two years of probation and a $25,000 fine. We hope everything works out this time around, pal.